SAN DIEGO, Calif. (Feb. 1, 2019) – ElliptiGO Inc., the pioneer and world leader in stand up cycling, and Noxgear, creators of premier advanced visibility gear, are teaming up to inspire athletes to brighten up their winter workouts. The Ride & Shine Giveaway will award prize packs worth over $1,200, featuring the tools they need to glow and go for their goals. Entries will be accepted until Feb. 17, 2019. To enter, visit www.ElliptiGO.com/ride-and-shine. 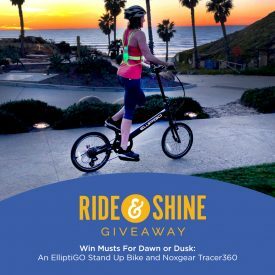 One grand prize winner will be beaming when they win an ElliptiGO Stand Up Bike (SUB) as well as a Noxgear Tracer360 vest and Lighthound harness. Two runner-up winners will win a Noxgear Tracer360 vest and Lighthound harness. The three winners will be randomly selected on Feb. 18, 2019. For more information on ElliptiGO or to find a dealer, visit www.elliptigo.com. For more information on Noxgear, visit www.noxgear.com. ElliptiGO Inc. is the pioneer and world leader in stand up cycling. ElliptiGO launched the first elliptical bicycle in 2010 and, most recently, the first stand up bike (SUB.) Headquartered in Solana Beach, Calif., the organization strives to embody five key values: caring, inspiration, innovation, fun and integrity. All ElliptiGO bikes deliver an enjoyable, comfortable and effective workout experience that inspires people to improve their lives and enjoy the outdoors. ElliptiGO bikes are distributed through specialty running, cycling and fitness retailers nationwide, at the ElliptiGO headquarters and online. For more information, visit www.elliptigo.com. Noxgear revolutionized visibility for riders, runners and walkers in 2013 with the introduction of the Tracer360 Visibility Vest. Former aerospace engineers, Simon Curran and Tom Walters, combined cutting edge advancements in LEDs, electronics and materials to develop the Tracer360 Vest and later the LightHound Illuminated Harness. The company, headquartered in Columbus, Ohio, is committed to outstanding customer service and developing innovative products for the active lifestyle. Learn more at www.noxgear.com.